S&L Therapy’s Speech & Language Blog - Boston Speech Language Therapy in Brookline, MA 02445. 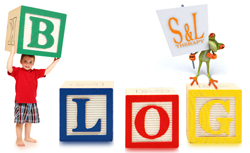 Our Speech Blog (blog, short for weblog) is a great way for us to share with patients, parents, and other professionals about all things related to S&L Therapy and the field of Speech-Language Pathology. As you read through the S&L Therapy Speech Blog you’ll find many articles that cover a variety of categories and topics organized for their target audiences: Kids, Parents, and Industry Professionals. If you have suggestions or requests for articles or topics please let us know! Enjoy our speech and language blog! Will an iPad make my child talk?